Sometimes, the history that captivates us most isn’t the one that has shaped who we are but instead is the one that has shaped others. I didn’t grow up in the town where I now live, and no significant life events have occurred here (yet). Despite that, I can’t shake the nostalgia that often hits me at the oddest times. Take, for example, my daily mail run during the work week. 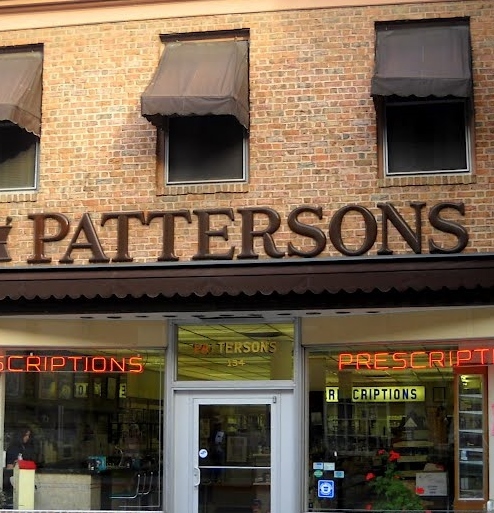 My office is located two blocks from Patterson’s Pharmacy, where a mailbox sits just outside of the picture windows. Almost every day, when I am dropping off the office mail, I glance in at the patrons sitting at the old-fashion soda fountain. For the most part, these individuals are, at a minimum, a couple of decades older than I am. Most are at least 30 years older. Sometimes they wave at me, but often they don’t because they are too engrossed in conversation. Despite their general camaraderie, there is always at least one person who hides behind the daily newspaper, with his head stuck in so far that I’m not sure he’s reading or using the paper as a shelter from the outside world. I’ve never noticed what or whether people are eating or drinking, but my guess is they are generally sipping cups of coffee rather than the homemade milkshakes, malts and sodas that interest the younger generation. These are the treats that my children and friends enjoy despite, or maybe because of, the old-fashion counter, historic photos and the general slow pace of the place. Last Friday, my daughter and her friend asked me to take them to Patterson’s. 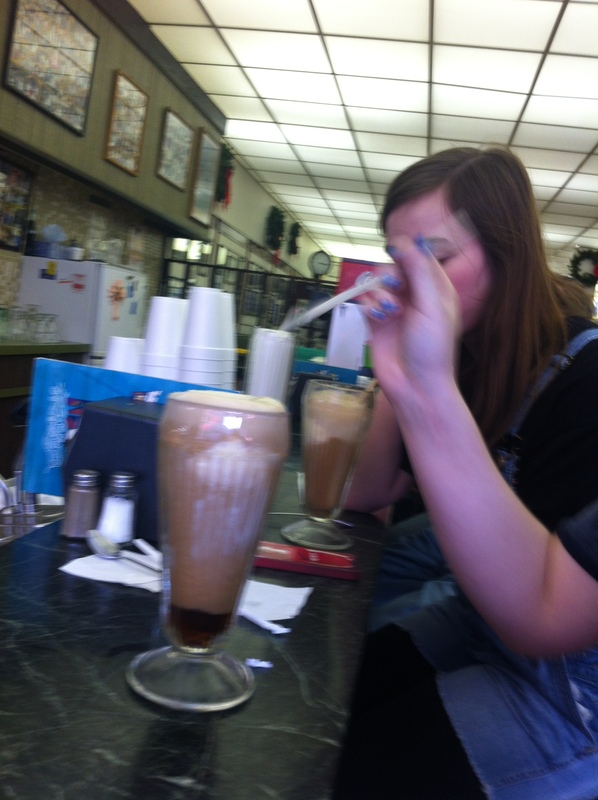 We took our seats on the soda fountain stools, even though no one was behind counter. The old woman next to me in the knitted cap didn’t say anything. The two elderly gentleman on the stools at the end of the counter were quiet for about five minutes until I asked the girls if they were willing to wait or wanted to go elsewhere. No one said who “she” was. Everyone knew it was Ginny, whom I also see daily and has worked at Patterson’s since I moved to town. No one seemed concern about Ginny’s absence. That’s the slow pace of business at a place like Patterson’s. At Patterson’s, people are important. I know this because they are one of very few pharmacies that provide services to the people whom Catholic Charities, where I work, helps. These are people who often can’t even afford the $1.00 co-pay needed for a prescription. But Patterson’s works with us to ensure that people who need help get help. And sometimes that help doesn’t come in a bottle but instead comes in the form of a safe place. Last Friday, as my daughter, her friend and I waited for Ginny, the old woman in the knit cap on the stool next to me finally began talking. “How old are your girls?” she asked me. I looked at my daughter and her friend. Neither was wearing makeup and both were wearing t-shirts and Converse tennis shoes. To me, they looked exactly 13. “In my day, kids were a lot smaller,” she said. “Hmmm,” I responded. Ginny was back, and I ordered the root beer floats. “Hmmm,” I said as Ginny filled glasses with root beer and added a scoops of ice cream. “What is that?” the woman asked looking at a glass with a bit of suspicion. “A root beer float,” I answered. She shrugged then looked at my daughter and her friend. “What are they drinking?” she asked. “Root beer floats,” I answered. And so are conversation went. She asked me the same questions and when I answered, she gave me the same responses and the same complaints. When the root beer floats were gone and the girls were ready to go, the woman said goodbye then struck up a conversation with Ginny behind the counter. “How are you feeling today, Shirley?” Ginny asked. “But they know you,” I thought as my daughter and her friend smiled at her and said goodbye as we walked out the door. Posted on January 3, 2015, in Family, history, My life, people and tagged Family, life, Martinsburg, memories, musings, nostalgia, parenting, Patterson's, People, personal, perspective, small business, Thoughts. Bookmark the permalink. 1 Comment. Patterson’s has a long history!! Lots of the same folks hang out there everyday!! Small town fun stuff! !